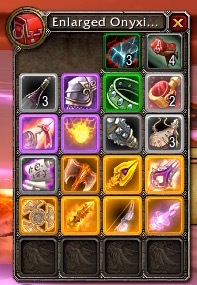 If you've run Tempest Keep, you recognize the items highlighted in orange in the bag. Ah yes. These are the legendary weapons Kael'thas Sunstrider gives you at one point in his fight. At level, you needed these weapons to overcome the adds. Now, they take up bag space or are ignored after the phase when you or the group defeats them. you want Ashes of A'lar. All are valid reasons for running the encounter. The battle pets and the mount are reasons to run this every week. It took me years to get my Ashes of A'lar mount. We came up with another reason we're suggesting. What if you could hold onto these weapons for a time outside of the raid? There are a number of things; the ephemeral fishing pole is a good example; that are considered temporary items, but you get to use them for a fixed amount of time. The fishing pole lasts for 24 hours in real time. How that works is you get the pole and the timer starts. Every time you log in, more time is taken off the use of the pole until that 24 hours is up. If you play one hour every day, it will take you 24 days to have the pole despawn. The fishing hats you can fish up in your level 3 fishing shack last for 7 days; again, in real time. What if these weapons from Tempest Keep lasted for 7 days, real time? They wouldn't have to scale, although that would be cool. I'd use the shield and mace on my warrior cow for older content just because they look cool. Don't allow them for use as transmog, but I like the idea of having these unique weapon skins out in the world for more people to see.